I'm starting this topic mainly because I've found no reference of this module on the forums, as a warning to others and/or maybe as a discussion about troubleshooting sound generation issues. My local vendor only had the XY-V17B mp3 module in stock, so I went with it, ordered, picked it up, read through the manual several times until I finally understood its I guess badly translated english version (here's the pdf version: XY-V17B manual or just search 13288.pdf) connected everything on a protoboard aaand... it clips horribly. I'm guessing it's some power supply issue. I've tried including some capacitors but I have to admit I don't really know what I'm doing. The mp3 module works either on 5V or 3.3V and I've reduced the test to its bare minimum, using de arduino as a 3.3V power supply to see if the I0-7 ports receiving a 5V HIGH signal from the arduino were the culprit (see schematic below). And it still clips the speaker: a buzzing, vibrating noise over the mp3 soundtrack that's being played. The amp has its own separate 5V power supply to avoid contamination, I've used coaxial cable to comunicate between the mp3 module DAC outputs and the amp's inputs, with a ferrite filter. It still clips. So, I'm not confident enough in my skills to assert this module is not compatible with arduino, after all, the first post might prove me wrong with a simple solution I haven't thought of, but... caveat emptor. The amp has its own separate 5V power supply to avoid contamination, I've used coaxial cable to comunicate between the mp3 module DAC outputs and the amp's inputs, with a ferrite filter. It still clips. I don't think you understand what clipping is. It has nothing to do with lack of ferrite filters or power supply "contamination" you actually mean noise. It is to do with too much input to a circuit trying to drive the output beyond the power rail. That schematic shows you have no common ground between the amplifier's power supply and the rest of the circuit. 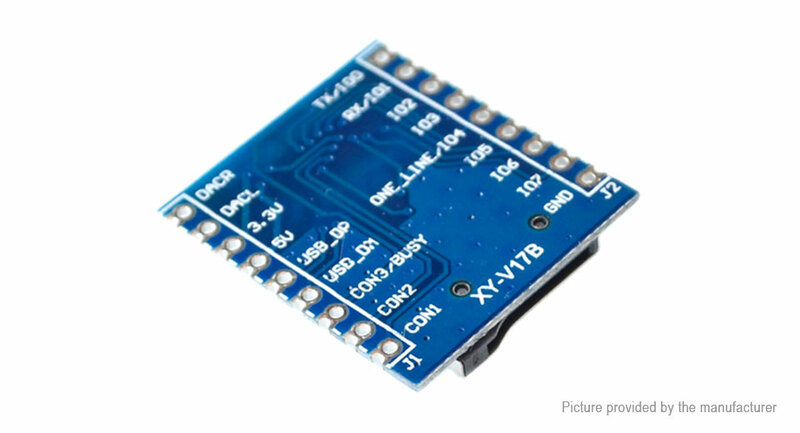 Also supplying 3V3 by the Arduino's limited current regulator is also probably causing you problems. Good because I see no reason why it should be incomparable.